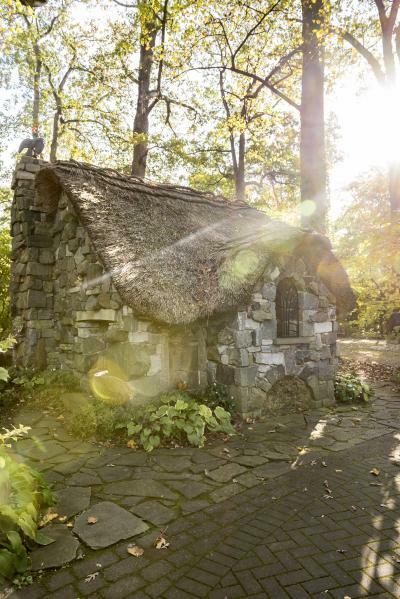 Thirteen fantastic structures—from a Gothic-inspired tower and an Ottoman tent to American summerhouses and a faerie cottage—await exploration in Follies: Architectural Whimsy in the Garden, Winterthur Museum, Garden & Library&apos;s first-ever garden exhibition, on view starting April 1, 2018. Some of the follies are newly built structures based on classic and contemporary examples at estates elsewhere. Others are historic structures currently in the garden that visitors have enjoyed for years. Together they form a delightful, entertaining, and fresh way for visitors to discover and experience the Winterthur Garden. A folly is a structure placed in a garden or landscape, built primarily for decoration, but suggesting through its appearance some other purpose. Follies amuse the observer, frame a vista, or pique the viewer’s curiosity. Follies are often placed to create a destination for visitors as they explore a garden or estate. The 60-acre Winterthur Garden is surrounded by nearly 1,000 acres of meadows, farmland, and waterways. The views in every direction are important to the whole. The paths are an integral part of to the overall design, curving rather than straight, following the contours of the land, passing around trees, drawing walkers into the garden. The garden itself is a perfect setting for follies. Needle’s Eye—Inspired by a folly constructed in the 18th century in Yorkshire, England, the Needle’s Eye floats on a pond adjacent to Winterthur’s main drive, creating reflections in the water and capturing visitor’s interest as they enter the estate. Neoclassical Folly—This structure is modeled after the portico, or entrance, to a Greek temple or public building and is a common design in garden architecture. The formality of the structure contrasts sharply with Winterthur’s meadow surrounding it. Ottoman Tent—This folly is an interpretation of a Turkish tent, reflecting the fashion for tents and other decorative arts inspired by the Ottoman Empire. Similar examples of 18th-century exotic tents can be seen in England, France, and Northern Europe, preserved in museums and gardens. Gothic Tower—This gothic-inspired folly is similar to the towers, sham castles, and fake ruins that were very popular in European landscapes in the 1700s and 1800s. These towers would be highly visible and would give a sense of age and importance to the property. Brick Lookout—This little building is an example of how Henry Francis du Pont repurposed architectural elements. It once served as a shed at the entrance court for the museum in the 1940s and 1950s. When a new brick folly was built in the 1960s and placed on Sycamore Hill, the shed’s tin roof and cast-iron eagle were moved to cap the structure. Follies: Architectural Whimsy in the Garden can be enjoyed on foot or from the garden tram. A one-mile walking loop takes approximately 45 minutes at a leisurely pace. The main path through the garden is wheelchair and stroller accessible. During the exhibition, the garden will be open until dusk. Follies: Architectural Whimsy in the Garden will be on view from April 1, 2018, through January 5, 2020. The exhibition is presented by DuPont. Winterthur will offer a host of special programs, lectures, tours, and other activities to complement the exhibition. The 1,000-acre Winterthur estate encompasses rolling hills, streams, meadows, and forests. Founder Henry Francis du Pont (1880–1969) selected the choicest plants from around the world to enhance the natural setting, arranging them in lyrical color combinations and carefully orchestrating a succession of bloom from late January to November. Du Pont translated his love of the land into a unified work of art that embodies a romantic vision of nature’s beauty. Winterthur—known worldwide for its preeminent collection of American decorative arts, naturalistic gardens, and research library for the study of American art and material culture—offers a variety of tours, exhibitions, programs, and activities throughout the year. General admission includes a tour of some of the most notable spaces in the 175-room house as well as access to the Winterthur Garden and Galleries, special exhibitions, a narrated tram tour (weather permitting), the Campbell Collection of Soup Tureens, and the Enchanted Woods children’s garden. $20 adults; $18 for students and seniors; $6 for ages 2–11.